I’m partial to grave markers that include an etching of the person buried there. It’s one thing to read about them, but pretty cool to see what they looked like. 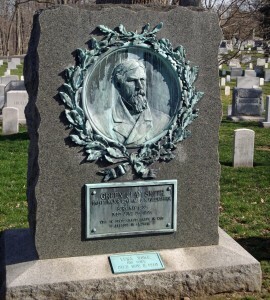 Green Clay Smith is among a handful of large markers that include portraits of those buried in Section 1 in the rear of Arlington National Cemetery. Smith was a brevet major general during the Civil War. He was also a Kentucky congressman and territorial governor of Montana. He ran for president on the Prohibition ticket in 1876 after becoming a Baptist minister in Washington. This entry was posted in Arlington National Cemetery and tagged Arlington National Cemetery, Best Arlington National Cemetery tours, Green Clay Smith, Photo by Rick Snider. Bookmark the permalink.